“I guess you all made it okay! Nobody died, right?” asked Paul, the outfitter from Adventures in Paradise. We looked like we did when we left about a week ago, after Paul and Debbie had dropped us off in Waianapanapa during a torrential downpour. We may have looked the same but we did not feel the same, glowing in an aura of maika’i. The rain was just beginning to fall at Keanae that first day while we were enroute to Hana and Waianapanapa. It started to really come down by the time we reached Waianapanapa campground and we were totally saturated as we unloaded gear and kayaks from the truck. After setting up our tents, Paul asked if there was anybody interested in paddling from Koki Beach, about 4 miles farther up the coast, back to Waianapanapa. Looking down at the cove, we could see a large set of waves crashing on the coarse black sand, sending flecks of white clouds up on the dark shore. Then another squall came in and the horizon was totally grey. That sealed the decision for me -- no way! Not for Maghna, Rusty, Doug, Andy, Jody, and Gary, though. They were apparently having serious paddling withdrawals and decided to go out in the storm. Off they went, leaving the rest of us to arrange the campsite, zipping up tent windows hastily left opened by the “Storm Riders” as they rushed off to their appointments with oblivion. When the “Storm Riders” returned to rainy Waianapanapa, the excitement of the wild ride was not enough; they needed one more rush before the sun went down, in the form of a little spelunking. The cave at Waianapanapa is full of legends, and most people have gone only into the first chamber. My interest peaked, however, as I listened to Andy, Jody, and Gary's voices get softer and softer as they went deeper and deeper into the wet cave. It was also getting darker as dusk was about to begin. All of a sudden, the trio emerged at the top of the hill, looking like they had one heck of a climb through the mountain. When Andy and Jody offered to take Ellen, Dani, and me through the same trip, I had second thoughts. 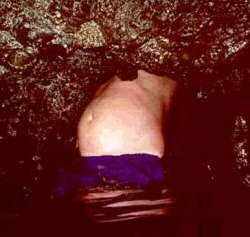 After all, it was a lot darker now and the water looked bone-chilling cold, all of which were confirmed when I jumped in. We proceeded to the back of the cave and went under the rock ledge. The rocky platform where legend says the Queen hid from the Alii was clearly visible. We then entered a puka at the back of this first chamber, feet first. A slide to the second chamber led to another cold shock in a surprisingly deep pool. We swam to the back of this chamber and proceeded through a small submerged opening and swam a short distance under a rock ledge. The third chamber was deep and, at the very end, there was a lava tube going up at a 45-degree angle. We climbed up the rocky ascent to the last dry chamber. The opening of the cave was on the left at the top of a 15-foot wall that required some rock climbing. If you attempt this venture, go with someone who has done the climb before - and take waterproof lights. It gets very dark in there! The next morning, the waves were pounding on the shore with the same intensity as the day before. Kayaks were pointed towards the ocean in anticipation of the rough take-off. One by one, the paddlers took off though the surf. As we waited for the group outside of the cove, 8-foot swells lifted the front of our kayaks. We were soon on our way to the next campsite at Ulaino. We stayed close to the lava formations that dot the Hana coastline, not wanting to stray far from land. Turning one of the corners, there was a nice lee that appeared to have a campsite with a freshly trimmed lawn. Could this be Ulaino? Andy went to scout and I got a call from Maghna over the radio that the campsite was clearly visible around the next point. Signaling to Andy that we were going to the next cove, I paddled on. Here was Ulaino, the fishing village and site of the largest heiau on Maui. The other campsite was someone’s private property. Bob had already landed in the mouth of a stream and said he was going to stay there. Far to the left was Doug with his kayak high on a boulder beach. Of the two spots, the river mouth looked like there were larger swells in the shore break, so I chose to paddle to where Doug, and now Rusty, had landed. Our campsite had a shed that proved to be a nice area to cook in, but it was in such terrible condition that it is hard to imagine that it will be there the next time we return. Most of the Hui chose the shed over the river mouth. We soon made our way to where Maghna, Bob, and Gary were spending the night in the path of what seemed like an endless line of tourists visiting the Helele’ike’oha Falls, better known as the “Blue Pool.” Blue Pool is a beautiful pool with a small waterfall surrounded by exotic flowering plants of red, yellow, and blue. 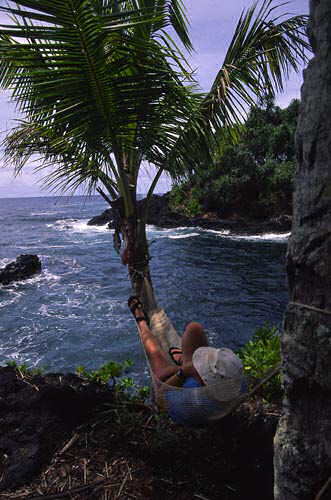 'Ape and ’awapuhi added a more tropical appearance to the flora. The whole area appeared carefully manicured, causing Dani to say it looked like something out of Disneyland. The next morning, Gary wanted to be on the water by 8:00 a.m. so we quickly packed our kayaks and were soon underway. The paddle to Nahiku was slow as we examined all of the caves we could get into. The ocean was very busy, crashing onto the cliffs. One cave was hidden in a cove that looked rough but, once we approached the entrance, it became clear that the deep and large cave was navigable. The rough Opuhano Point revealed the large and calm Honolulunui Bay at Nahiku, a broad and calm body of water. Gary had landed in the bay earlier and wanted everyone to swim to shore to see a big pool close to shore. 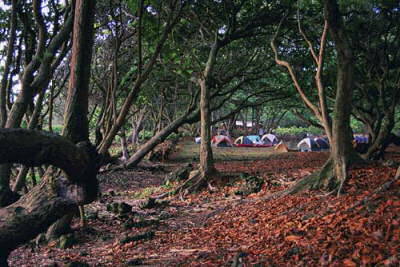 The next campsite was supposed to be Waiohue Bay but 4-foot breaks 25 yards offshore killed that idea. Maghna and I were more concerned about the next campsite so we paddled on. Along the way was a large pod of dolphins and Maghna could not resist jumping in to swim with them. I went ahead to look for Wailua Iki. Papiha Point was bumpy and it looked like the next campsite was way off. Paddling past Makoloaka Island, I viewed the lee of the Point and it looked calm! I radioed to Maghna that the landing was easy and soon everyone joined me. Most of the group camped on the riverbed while Francis, Wayne, Ellen, Doug, and I camped on the steep rocky area on the left, affectionately described by Maghna as the “grungy” side. Rain began to fall at 6:00 p.m. and stopped about 8:00 p.m. The next morning, several of us returned to Waiohue Bay to hike and do waterfall climbing. When we were ready to leave, the waves were still breaking outside of the bay and careening over rolling boulders. Although we were thoroughly intimidated, we made it out safely. After returning to Wailua Iki, we packed our kayaks and were off on the next paddle to Makaiwa Bay. Paddling to Makaiwa, it became apparent just how dry Maui has been these past months. Many of the waterfalls were completely dry. Large cylinders with dry plunge pools were a common sight. Noticeably absent at all of our campsites were running streams. Even with the heavy rains that we had, the streams were actually lower in the morning than the night before. The coordinates to Makaiwa were recorded in Wayne’s GPS which was a good thing because we needed the updates as we paddled in the rough waters. The water was exceptionally rough around O'opoulua Point and Wayne indicated that this was where Makaiwa was supposed to be. The deep bay looked different and Gary wanted to paddle a little past to make sure the next cove was not our campsite. As we paddled in, Rusty radioed for a description of that shore since the mouth of Makaiwa was rough. I radioed back “CALM!” much to the delight of all the people with radios. The clouds were gathering and it looked like we would have to set up our campsite in rain and, sure enough, the drops began to fall. It rained all night and, by morning, we were ready to move to the next campsite which, on paper, was supposed to be Pilale. The leaders wanted to go past that to an unknown bay that Doug, a professional travel photographer, had seen during a recent photo shoot. It had a lighthouse and two big rocks on both sides of the bay with crashing waves, but the shore looked calm at the time. We launched and soon exited through the “washing machine” mouth of Makaiwa with no idea of where we would end up for the night.